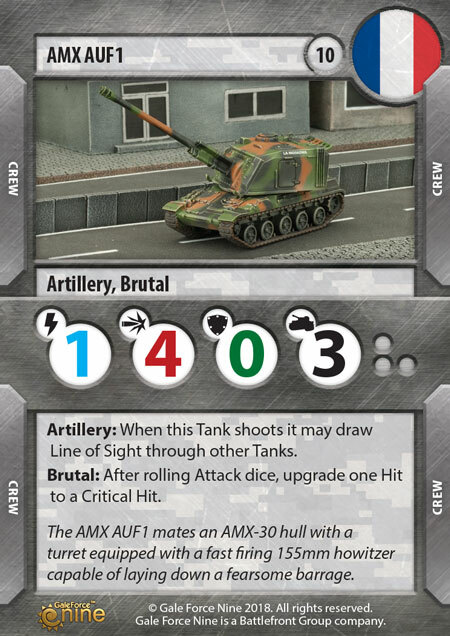 The AMX-30 is an incredibly flexible tank, coming in only at 13 points you get a well-rounded fighting machine. Along with having a base Attack of 4, the AMX-30 also has a 20mm automatic cannon AA gun built into its turret giving a higher than average Anti-Air attack. 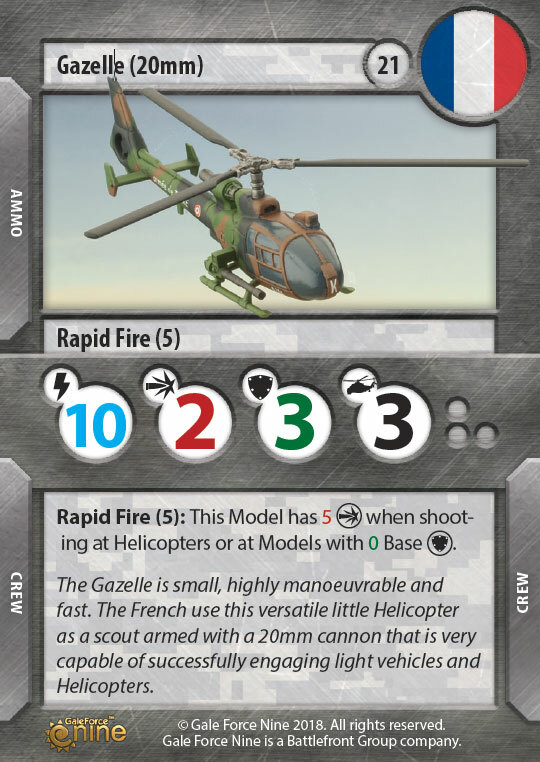 Being able to pose a threat to both Tanks and Helicopters is something quite powerful and makes this French tank very flexible. Want to run a swarm of these awesome tanks? At 13 points each you can easily fit seven AMX-30 in your Platoon for only 91 points. AMX AUF1 is the only Artillery tank in the game so far, giving it a special place in the French army. This tank can ignore other tanks when firing its main gun and gains a lot of other Artillery related options that will give it great tactical flexibility in the game. 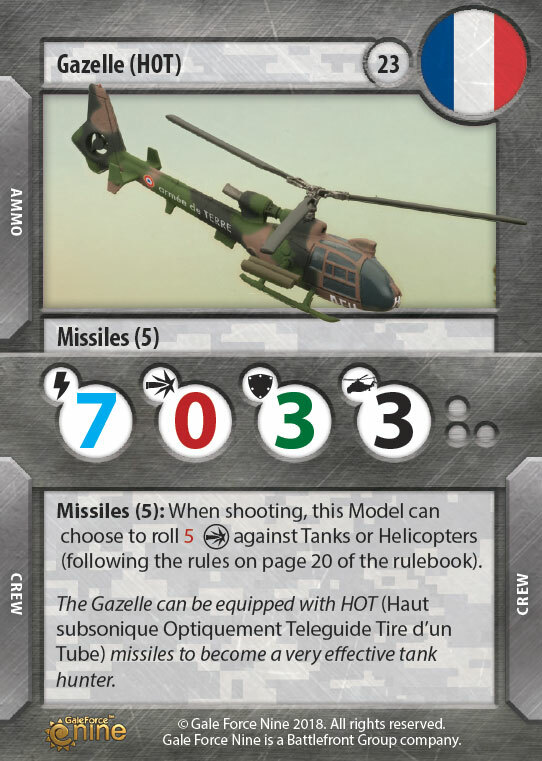 Gazelles are great little Helicopters giving the French the choice of either running the 20mm version with Rapid Fire (5) or Gazelle (HOT) with an Anti-Tank missile that is great at taking out even the most heavily armoured tank. 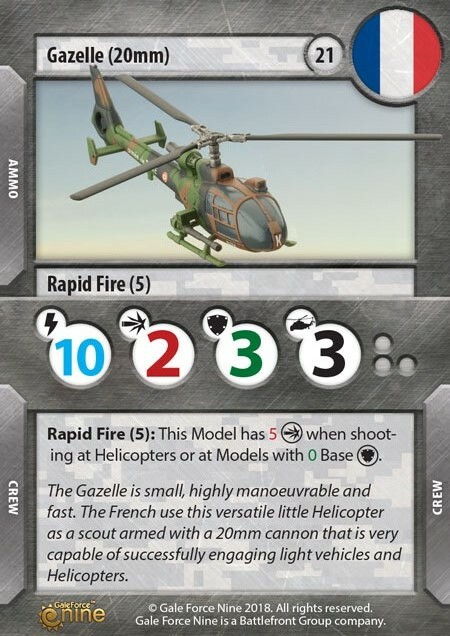 With low Damage Capacity you are relying on the Gazelle’s Defence, so adding cards that make its Defence more reliable is key to making sure it stay in the sky. 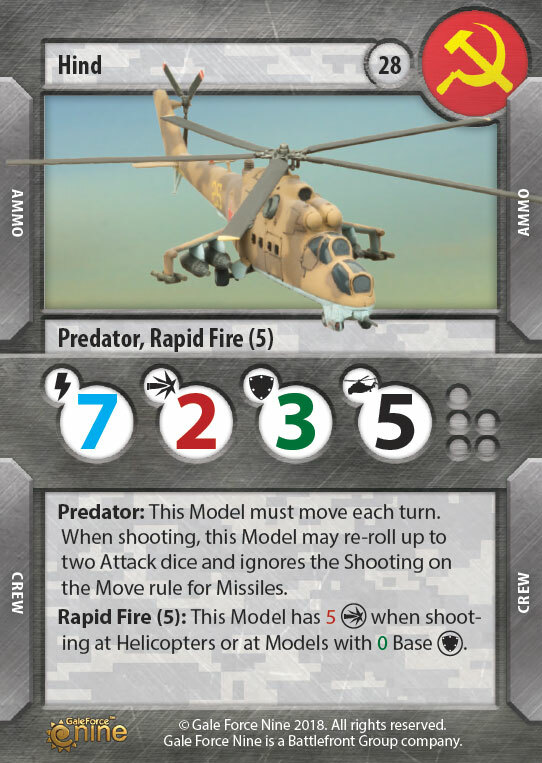 Defensive Manoeuvres is a powerful card that can save you from a bad Defence roll and give your Helicopter that one extra turn it needs to help deliver you the victory. Reveal is one of the new abilities crew cards can have in the game. Reveal is an ability that triggers when the card is first revealed during the game. One of the cards that use this new triggered keyword is the Charging Gunner. 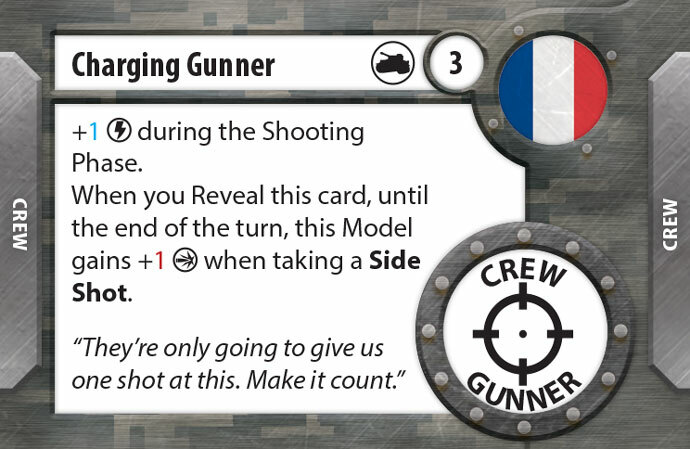 For 3 points the Charging Gunner gives you +1 Initiative during the shooting step, and when you reveal it, if you are hitting a target model on its side you also gain +1 Attack. 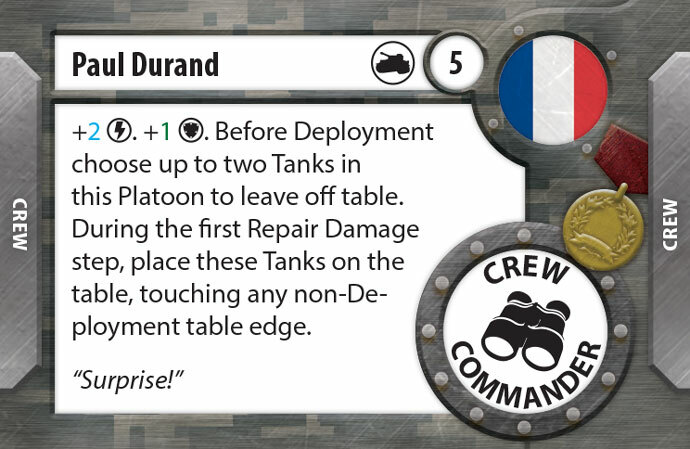 Paul Durand is one of the most interesting French Heroes, giving you the ability to put some of your tanks in reserve, to later place them on the table. 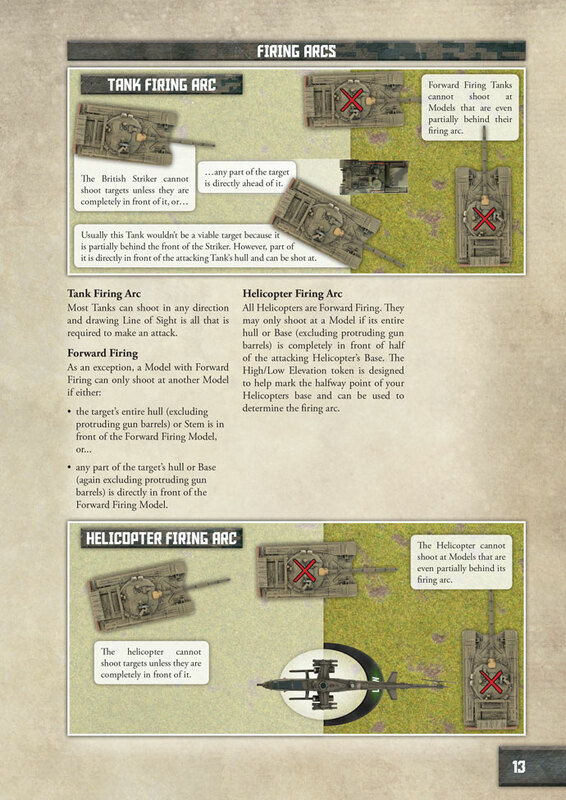 This ability is quite good for getting your tanks into flanking positions and making the most of your Platoon Rule. On top of that he gives his tank +2 Initiative and +1 Defence, giving you lots of value for just a single commander. The French have a proud military tradition and whilst crew warriors may not carry sabres like their predecessors, they have lost none of the elan and courage that made the French army one of the greatest in the world. The Chieftain and the Chieftain (Stillbrew) are two great tanks to choose from. Both Chieftain variants have great Attack and Damage Capacity stats. 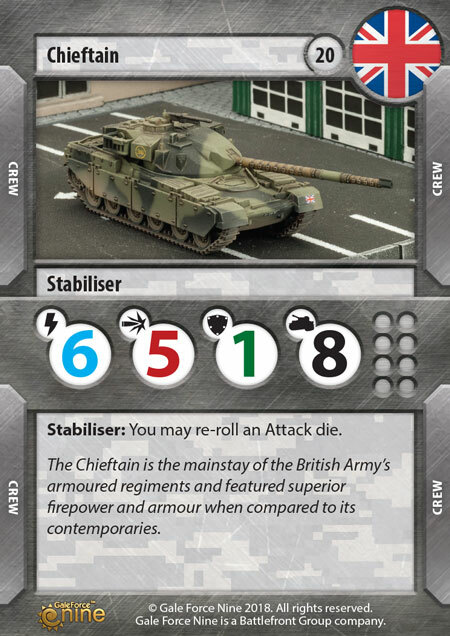 The Chieftain coming in at twenty points has a one more Initiative then the Chieftain (Stillbrew) at 24 points, but it also has one less defence. The extra Defence is a big advantage, but there is something to be said about running five Chieftain Tanks in a single list. Scimitar is a great little tank. 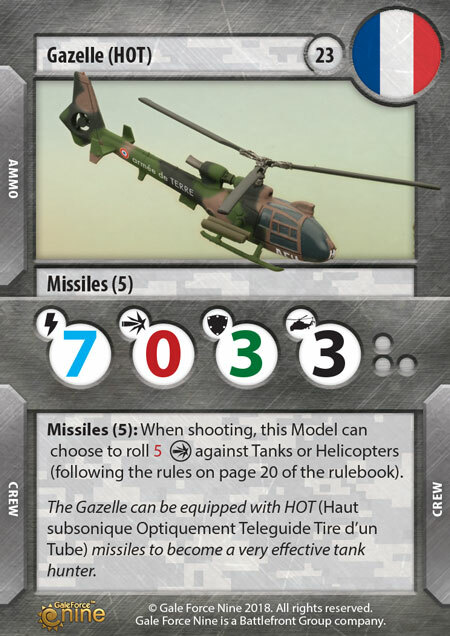 Because of its Rapid Fire (4) the Scimitar specialises in killing other light Tanks and Helicopters. On top of that it is fast, letting it move up to three times each time it chooses to move. Spearhead lets the Scimitar move three times before the game begins. 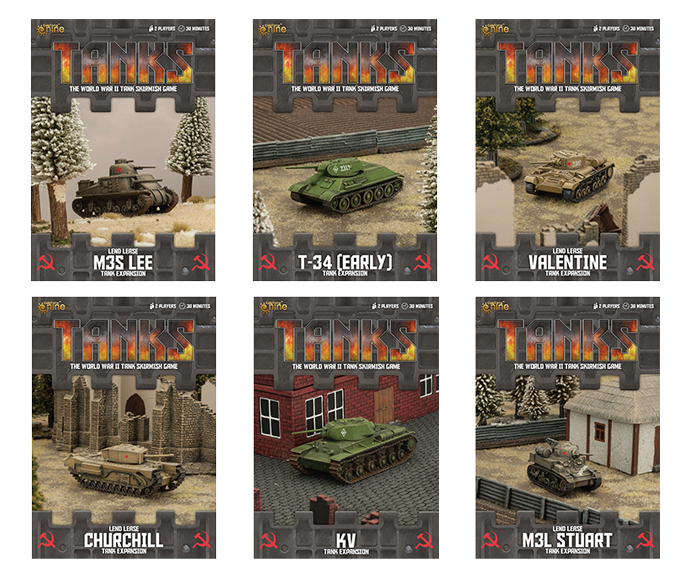 Making these tanks perfect to send out to take objectives or outflank your opponent’s tanks. 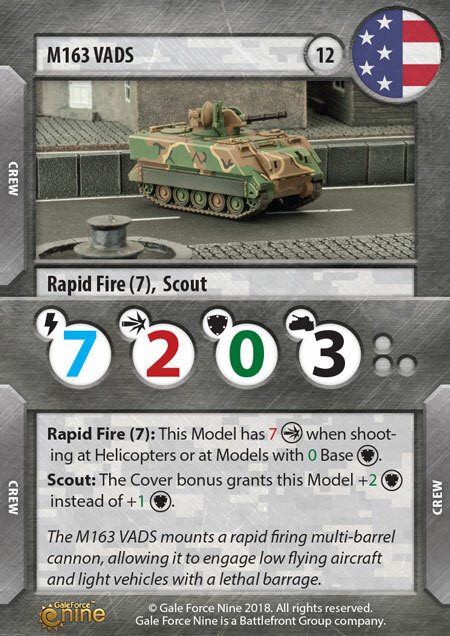 On top of all that this tank gets the Scout rule, so if it has Cover it gains an additional Defence die and on a tank with Base Defence 0 each point of Defence you can get is big. The Striker tank is a little tank that packs a big punch. At 13 points it might not seem like much, but its base stats are deceiving. First off this tank is fast, letting it move up to three times each time it chooses to move, so it can get to where it needs to be quickly. This is important for any missile carrier tank; as they want get to Cover as quickly as possible. 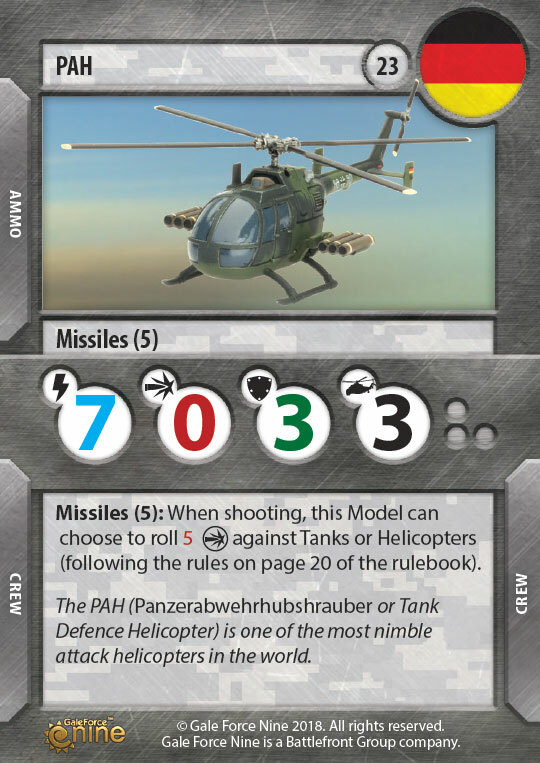 The Missile (5) rule gives this tank an impressive 5 Attack dice against both Tanks and Helicopters, making the Striker a flexible attacker. 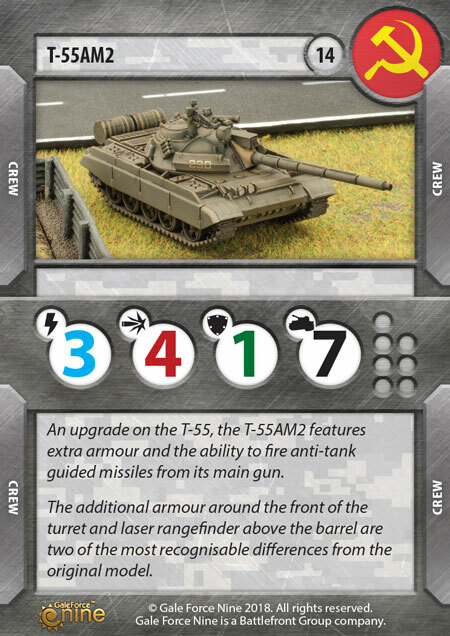 Just like the Scimitar this tank also has the Scout rule, so it will be able to add 2 to its 0 Base Defence while it is in Cover. The Lynx Helicopter works really well with the British Platoon rule. The Berlin Brigade increases its already high Defence of 3 to 4 while Stationary, add in Cover and you have a massive Defence of 5. 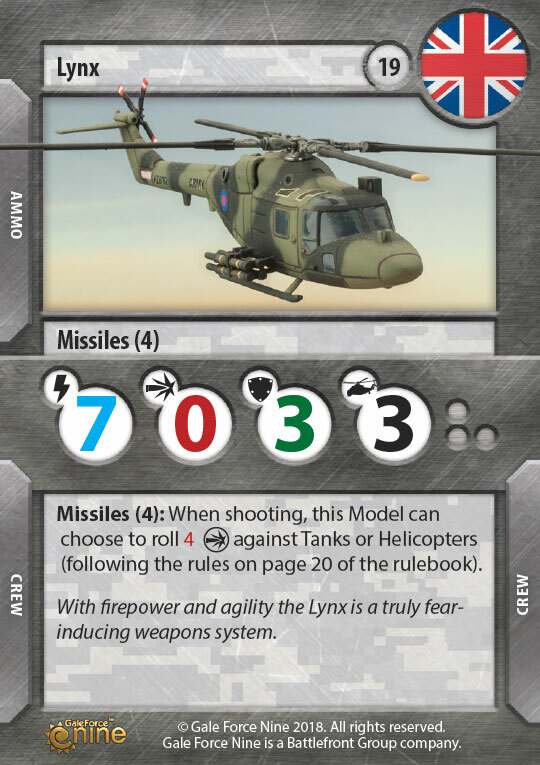 With its high Initiative and Defence the Lynx can deliver heavy hitting strikes form across the table and shrug off all but the most devastating attacks. 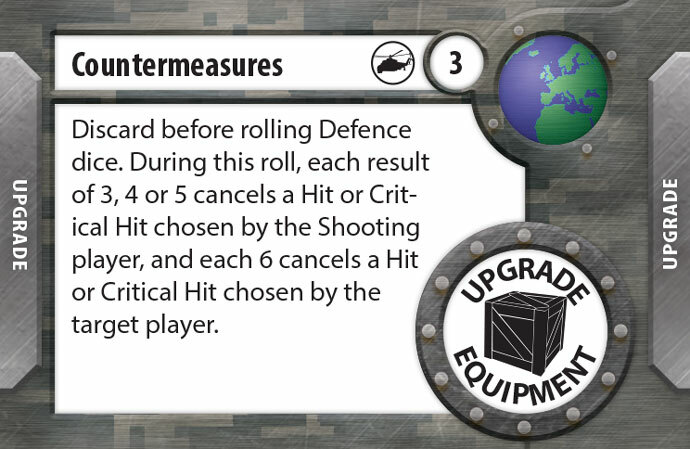 The Lynx relies heavily on its high Defence numbers to keep it alive, so cards like Countermeasures is perfect to insure you survive a particularly deadly attack. 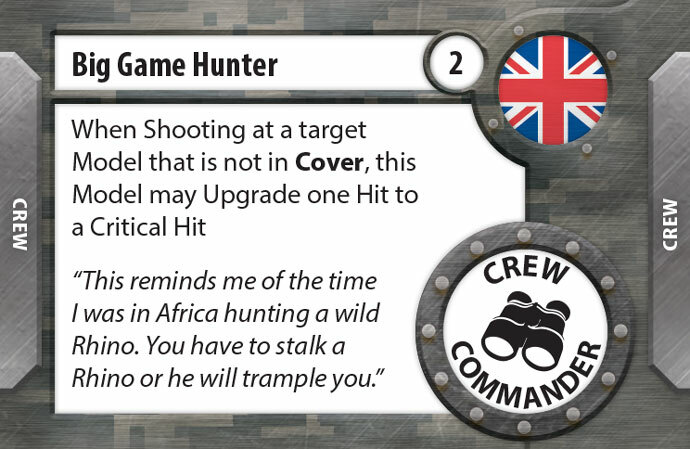 Big Game hunter is an upgrade that comes in at two points. 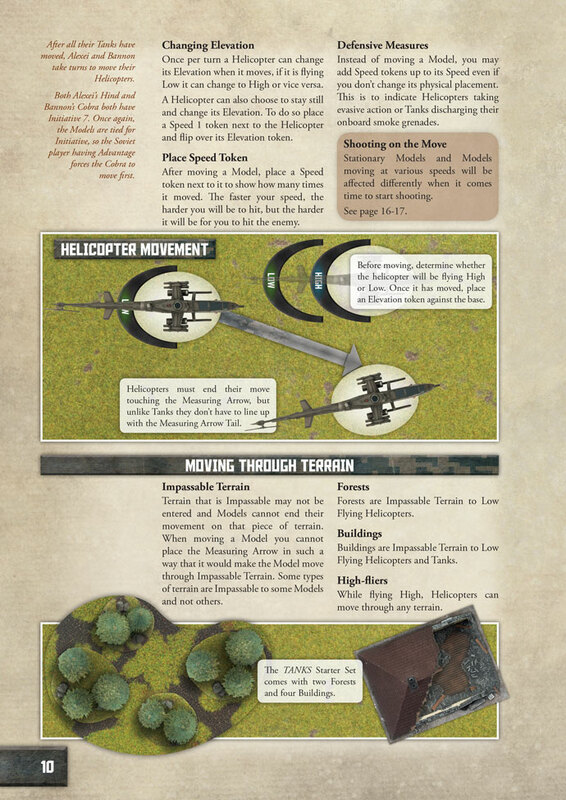 It may only be taken by a British tank and has the text, when shooting at a target model that is not in Cover, this model may upgrade one Hit to a Critical Hit. 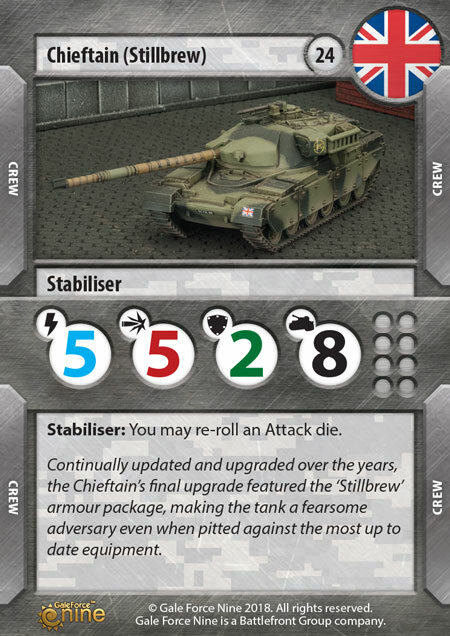 This card is awesome on British tanks, and it stacks really well with the other benefits British tanks get while Stationary. 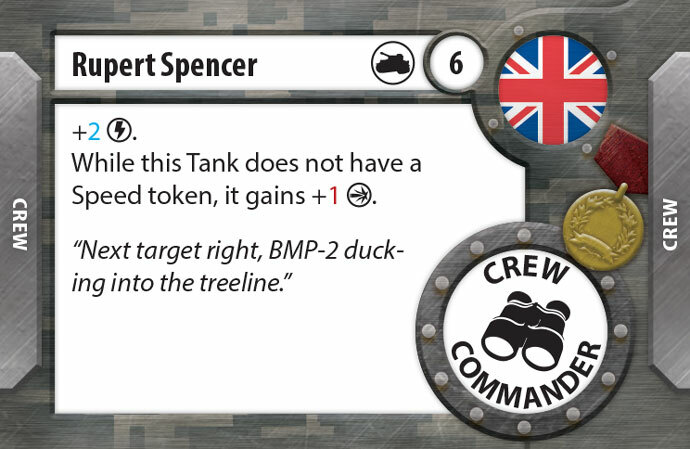 Rupert Spencer is a Hero that gives you even more benefits if you remain Stationary. Coming in at 6 points, Rupert gives you +2 Initiative, as well as +1 Attack while Stationary. Adding this to the normal Stationary rules and the Berlin Brigade Platoon card, and you will have a tank that beast while staying still. The Abrams is an amazing main battle tank with three awesome variants. 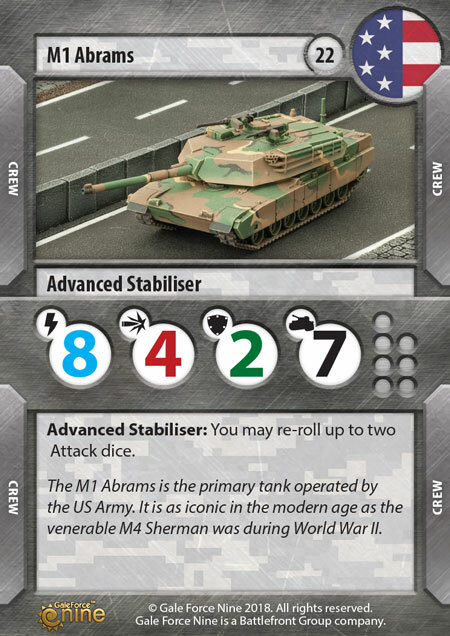 If you go with the M1 Abrams you are only paying 22 Points for a tank that has amazing all-round stats. 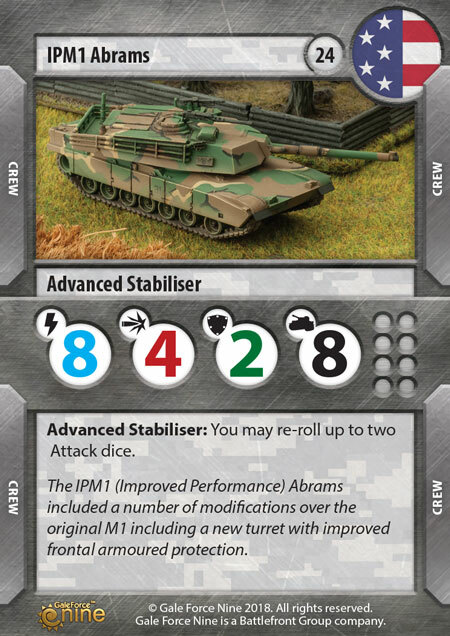 For just two more points you can get an IPM1 Abrams that has an extra +1 to its Damage Capacity, making an already awesome tank that much better. Want a bit more of a punch? 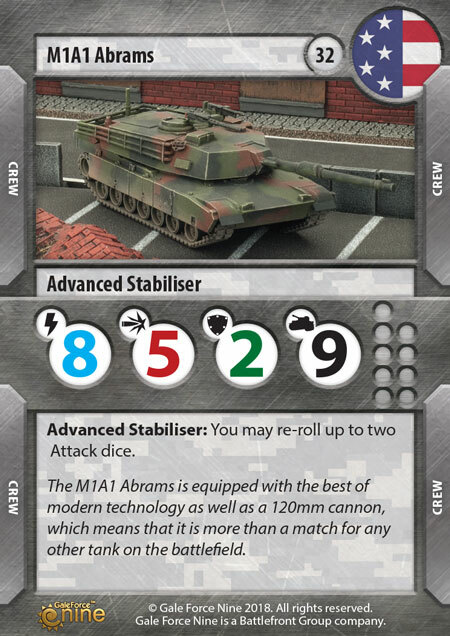 For 32 points you get the M1A1 Abrams, the best Tank the Americans have so far, with 5 Attack dice and Damage Capacity 9 this Tank will hit hard and is also really hard to destroy. With three variants you can always choose the best Abrams for your platoon. On the other side of the spectrum we have the ITV. This lightly armoured missile carrier is relying more on its Defence then its Damage Capacity to keep it alive. 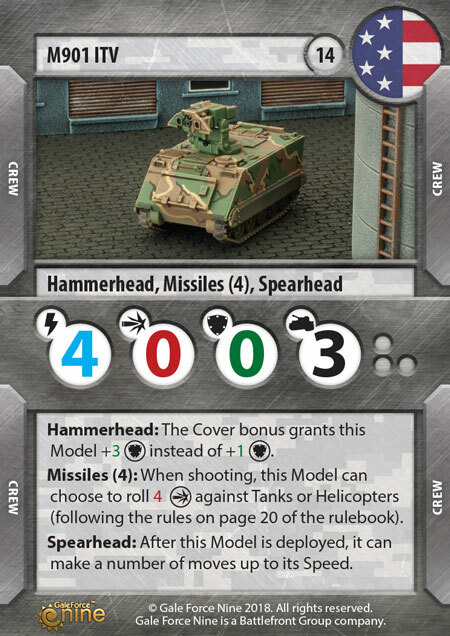 The Hammerhead rule gives the ITV a massive Defence of 3 when it’s in Cover, making it really hard to kill when it is well positioned. 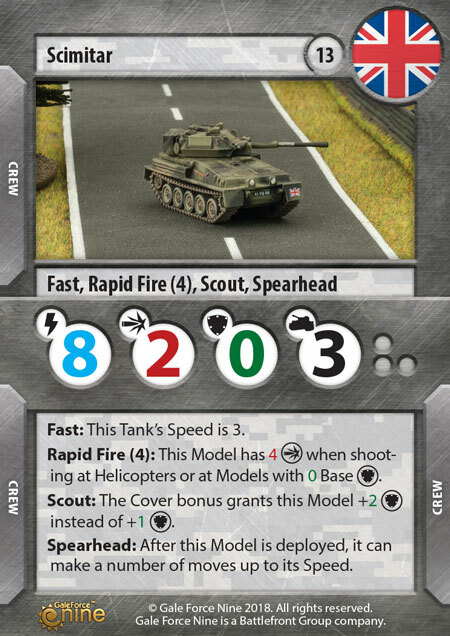 The addition of Spearhead is the icing on the cake when it comes to making the ITV the best tank it can be by giving it the ability to start the game in Cover is massive. 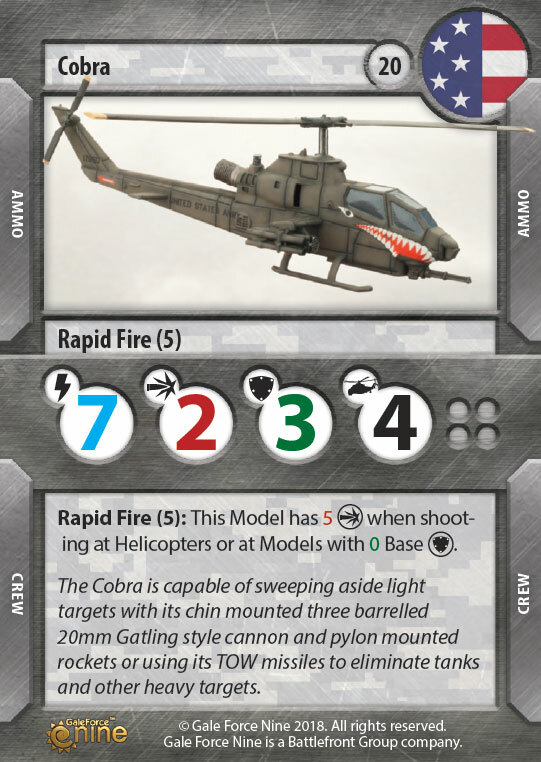 The Cobra is a fearsome attack helicopter with a great stat line. 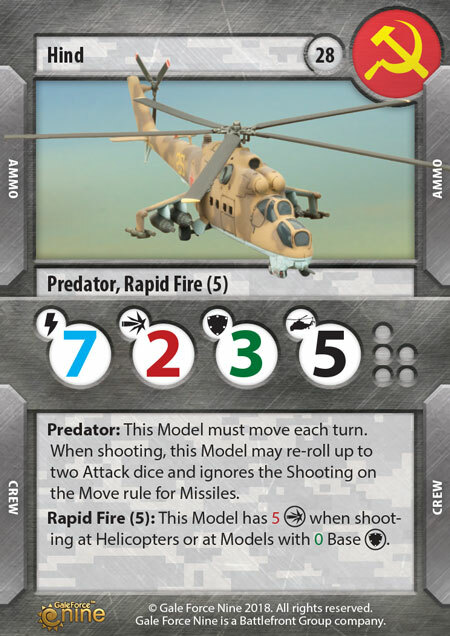 Rapid Fire (5) gives it a great attack against other Helicopters and Defence 0 targets. The Cobra also has two Ammo slots, giving it more choices for weaponry then some of the other Helicopters out there. 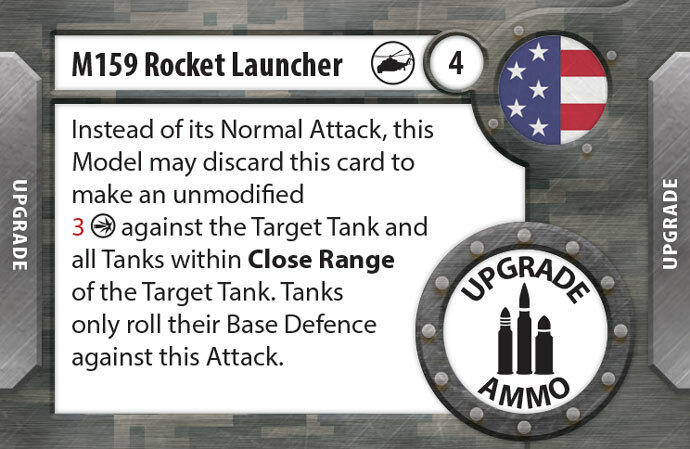 One of best Ammo cards you can equip is Rocket Launchers. 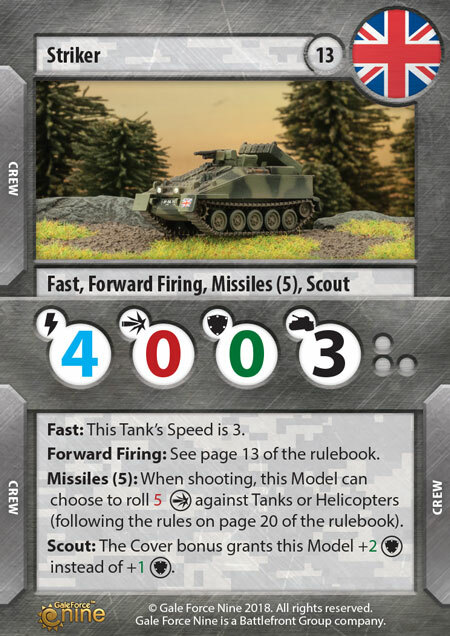 Rocket Launchers gives you a once per game Attack of 3 against a target tank and every tank within a Measuring Arrow of that tank, the perfect weapon to deploy against a swarm of light tanks. 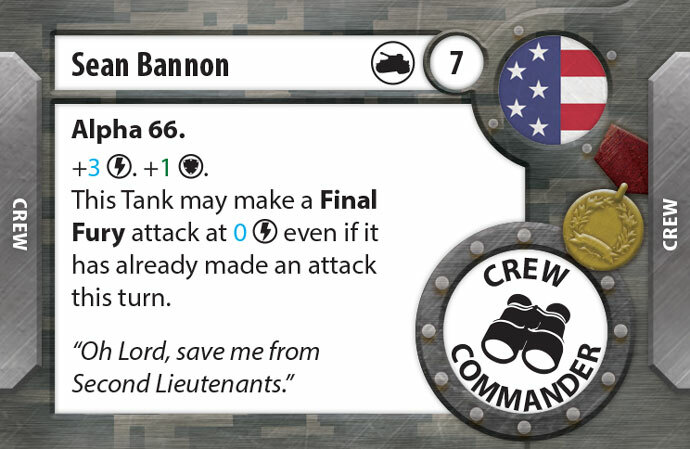 Bannon is an awesome commander, for just seven points you get +3 Initiative, +1 Defence and a cool ability. Bannon’s ability to make a Final Fury attack even if he has already made an attack this turn is a strong one, and can have his tank shooting twice on the turn he is destroyed. Bannon shines the best when he is in command of an Abrams tank, increasing its Initiative to a massive 11! 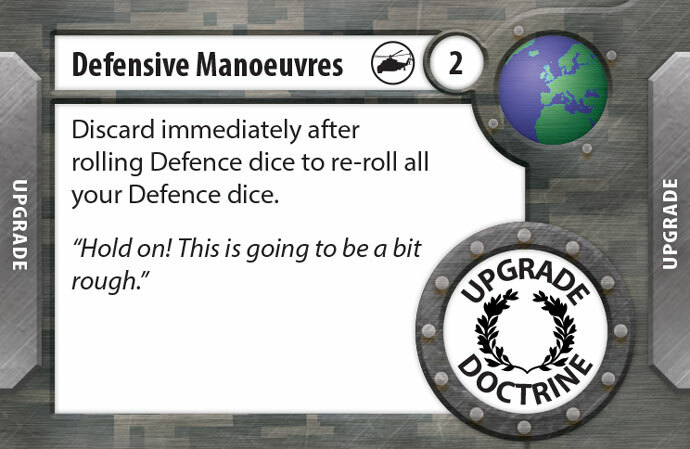 On top of that he also increases the Abrams’ Defence to an impressive 3. 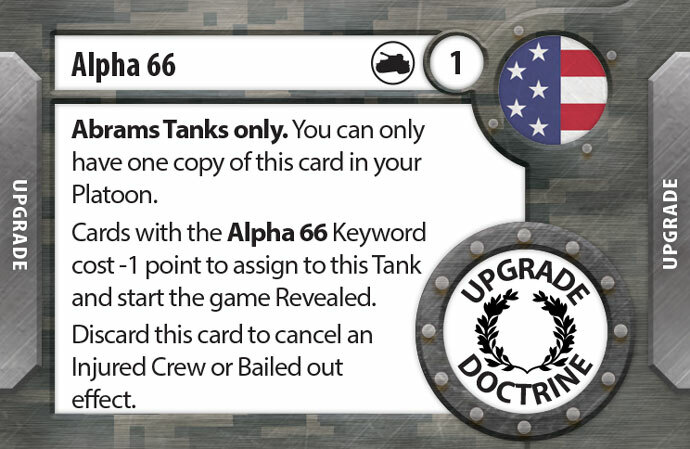 The Alpha 66 card gives a bonus to players who are focusing on running the crew of Alpha 66 (from the Team Yankee novel). Coming in at one point this card gives you a discount on every Alpha 66 crew member you add, as well as adding some protection. Having a point reduction on each of your crew cards for the price of having them revealed at the start of the game is not bad. Yeah, your opponent knows what is coming but the discount is well worth it. Also having some protection for Bannon and his crew is great. 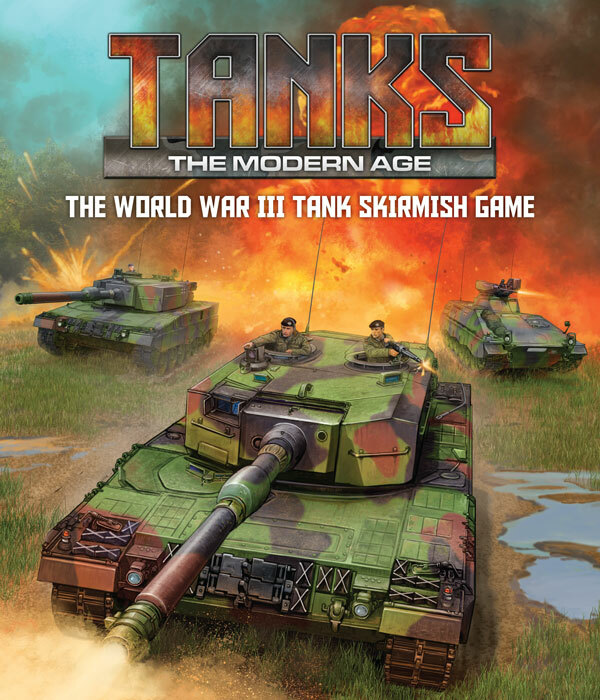 The widely successful TANKS game is turning the clock forward from World War II to the height of the Cold War. Choose your nation carefully as they each have their own strengths and weaknesses. 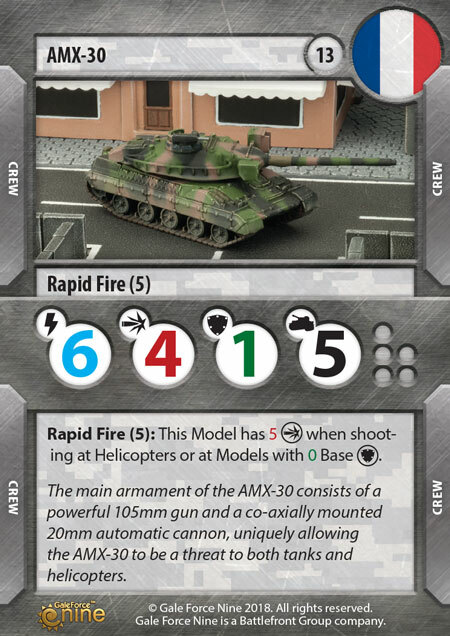 Do you pick the American forces with the old faithful M1 Abrams, Soviet forces and their numerous T-64, the mighty British Chieftain with its heavy armour, the popular German Leopard 2 and its powerful 120mm gun, or French AMX-30 that has speed to burn. 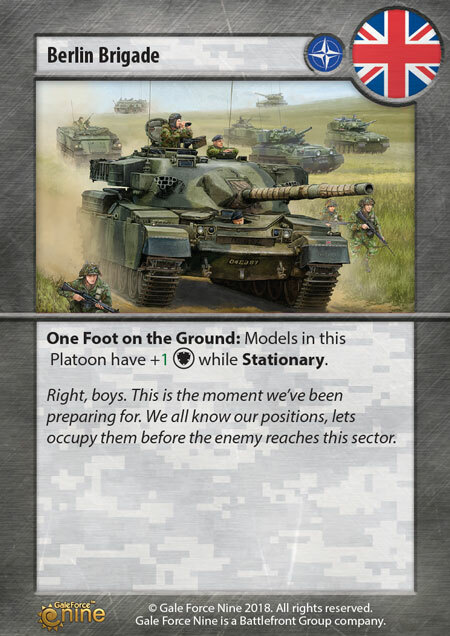 Beasts Of War is continuing their preview of the TANKS: The Modern Age. 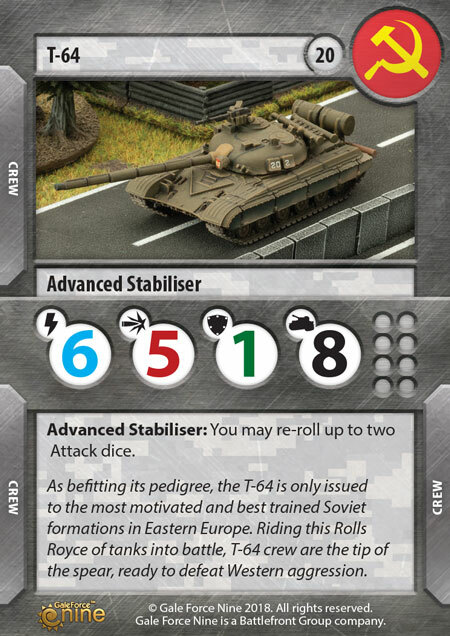 Following on their last preview of US and Soviet Forces, this time they are looking at the British and West German forces you can field such as the mighty Cheiftain and Leopard 2 tanks, and the smaller and nimbler Marder and Scimitar. 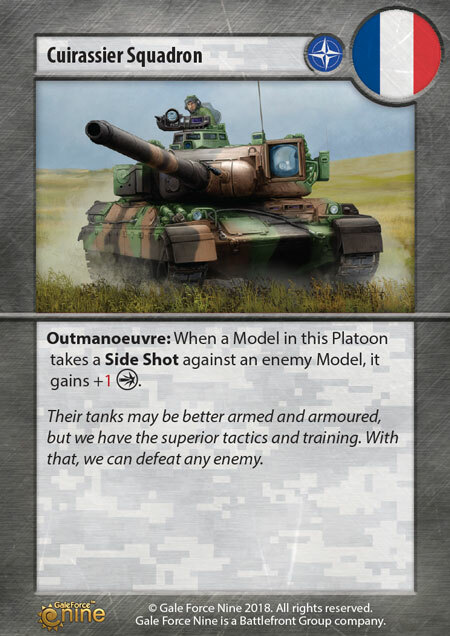 Be sure to get a look at the cards and units you can expect from TANKS: The Modern Age. 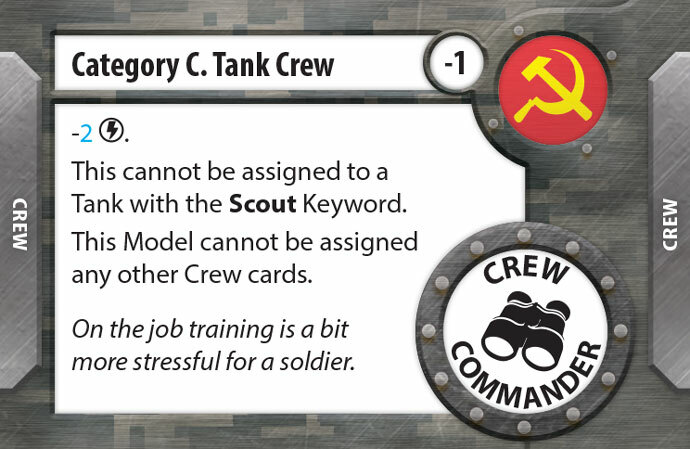 Beasts Of War has written up a preview of the units you'll field for Soviet and US forces in Tanks: The Modern Age. From tried and true tanks like the American M1 Abrams and the Soviet T-64. 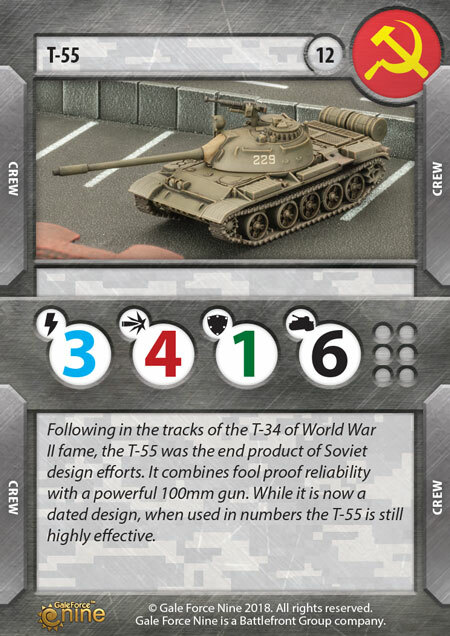 You'll also see some new comers to the plastic range like the T-62M and the LAV-25. 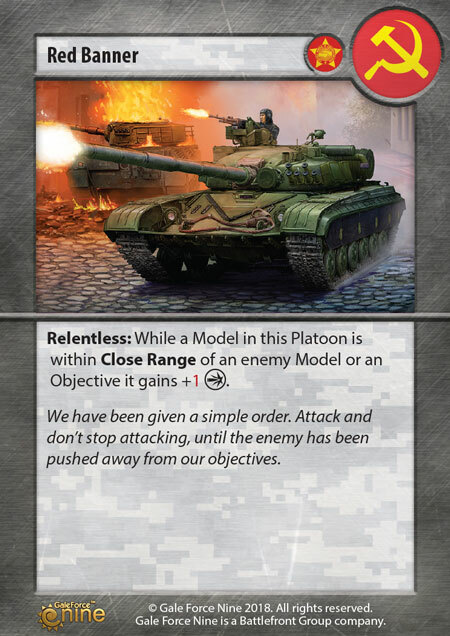 Get a sneak peak at the cards and stats over on the Beasts Of War website.